Faded brick ad for Rockford Standard Furniture Company at the corner of 9th Street and Railroad Avenue in Rockford, Illinois. At the turn of the last century, Rockford was a manufacturing powerhouse, especially for machine tools and furniture established by its large population of Swedish immigrants. 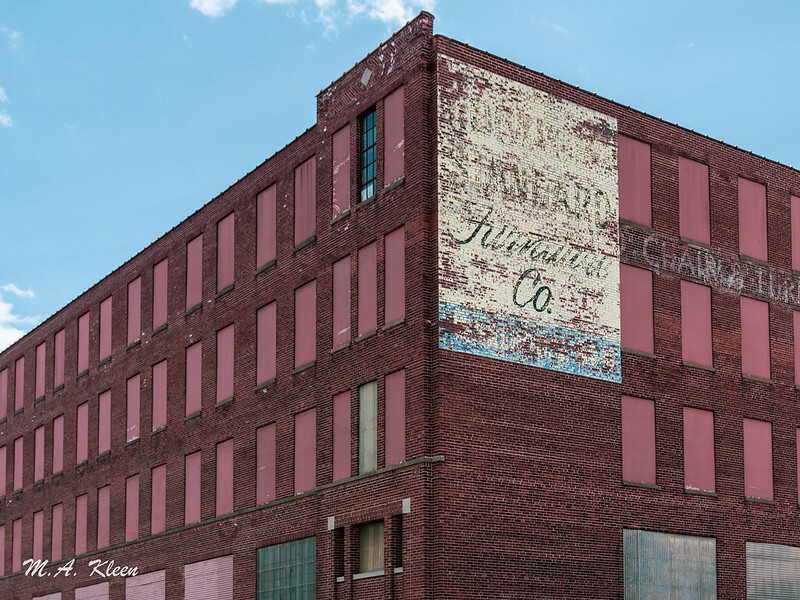 Rockford Standard Furniture opened in 1887 and manufactured dining room furniture, desks, and bookcases. Monument to Big. Gen. Gustavus Sniper (1836-1894) in Woodlawn Cemetery, 800 Grant Boulevard, Syracuse, Onondaga County, New York. Sniper was colonel of the 185th New York Volunteer Infantry. He was brevetted brigadier general on March 13, 1865 for “conspicuous gallantry in the battles of the Quaker Road and White Oak Road, Virginia.” These battles were fought at the opening of the Appomattox Campaign southwest of Petersburg, Virginia. The 185th NY was in Joshua L. Chamberlain’s (of Gettysburg fame) brigade of the First Division, V Corps. A roadside sign is all that reminds us of that time the British savagely burned the towns of Buffalo and Black Rock, New York to the ground. The Battle of Black Rock was fought on December 30, 1813 between British forces commanded by Major General Phineas Riall and American militia commanded by Major General Amos Hall in the present day city of Buffalo, New York along the Niagara River during the War of 1812. The engagement was a decisive British victory, resulting in the burning of Black Rock and Buffalo. On December 10, 1813, Brigadier General George McClure decided to abandon Fort George on the eastern bank of the Niagara River, which the United States had captured in May. His troops burned the nearby village of Newark to the ground before retreating across the river. The British wasted little time in retaliating, and they captured Fort Niagara by surprise on December 18th. Maj. Gen. Phineas Riall then floated 600 British regulars, 50 Canadian militia, and 400 American Indian allies to a landing site two miles downstream from Black Rock. Lt. Col. John Gordon and 370 men from the Royal Scots Regiment landed at Black Rock. Opposing them was Maj. Gen. Amos Hall and approximately 2,000 New York militiamen.